Product prices and availability are accurate as of 2019-04-18 12:32:29 UTC and are subject to change. Any price and availability information displayed on http://www.amazon.co.uk/ at the time of purchase will apply to the purchase of this product. 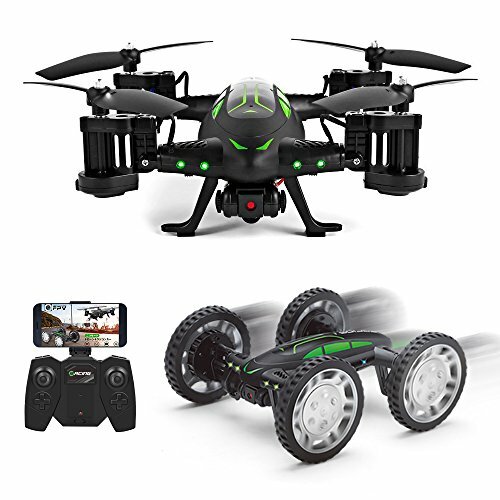 As soon as the drone is transmitted to the remote control, simply press the "Start / Land" button, the drone will start automatically; Press the button again, it is slowly placed on the floor. Suiltable for professional and beginners for training and playing indoor or outdoor. Instant fast reply! Amazing anti-jamming ability! 100 meter long control distance and less power consumption! The headless mode eliminates the distinction of the drone direction, the direction is the same as your transmitter, ideal for beginners. 2. There are some small part in this kit, if for children, please ask the adult to help if necessary. 3. Adapt the drone and controller successfully and install the propellers to the correct position, otherwise the drone will not take off.
? 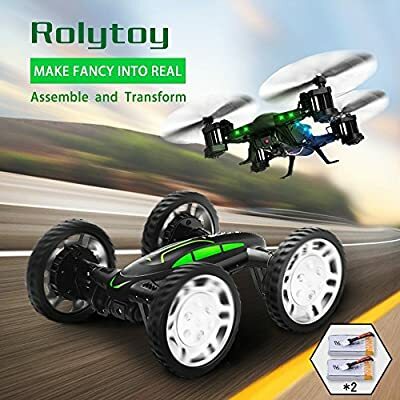 RC CAR Land Mode&FLYING DRONE Mode: Driving as a remote control car with high speed operation, take picture & video, WIFI Handy control, 360°Flips. Flying mode functions as a Quadcopter with function of Altitude Hold, one key start / landing, FPV camera, headless mode, gravity sensor. ? 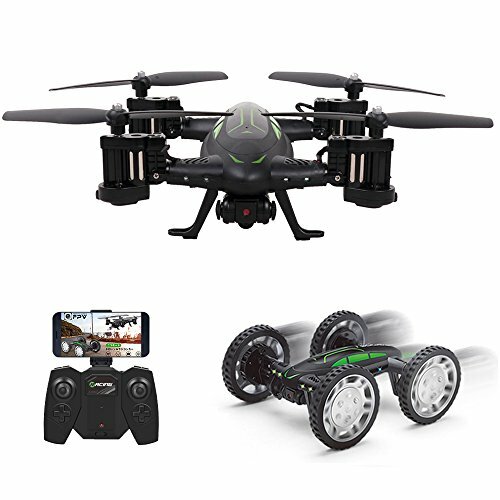 720P FPV Camera: Control the drone by Remote Control or Smart-phone (iOS / Android), which take great image & video and share to your friends via real-time transmission. ? Long Flying Time with 11 Leds Light: This drone comes with two 650mAh rechargeble lithium battery and a USB Charger to extend your flight time. The battery lasts for about 10 minutes under fly mode, 15 minutes under land mode. 11 LEDs navigation lights for night flight. ? 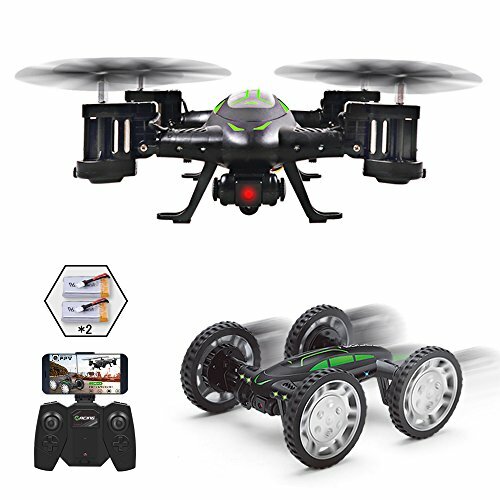 6 Axis Gyroscope: Equipped with the latest 6-axis flight control systems (3 gyroscopes and 3 accelerometers), advanced design ensures the precise positioning and stability of the quadcoptor. Easy to fly and control in the interior and outdoor with maximum wind resistance. ? 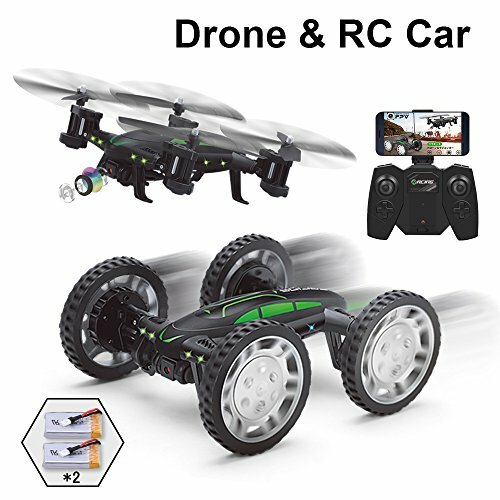 2.4GHz Control&4WD Power: 2.4GHz control system ensures the stronger anti-interference performance and powerful signal, even more than one drone is flying at the same time, they will not interfere with each other. Also 4WD power make the car have enough power to run on the land.